a. These rules govern the Blarney Stone Broadcasting, LMA with N Content Media, Inc. 92.3 WBNZ-FM / 99.3 WQAN-FM / 100.3 WQON-FM / 101.1 WGRY-FM / 101.9 WLDR-FM / WARD-AM 750 (the “Stations”), McLaren Northern Michigan (the “Sponsor”) “Get Up & Move Contest” (the “Promotion”) being conducted by Blarney Stone Broadcasting, LMA w/N Content Media, Inc, which will begin at 12:01am Eastern Time (“ET”) on 2/1/19 and will end at 12:00 NOON ET on 3/1/19 (“Entry Period”). * Take a selfie photo displaying any type of physical activity and comment with your picture to the pinned post on the Blarney Stone Broadcasting (https://www.facebook.com/BlarneyStoneBroadcasting/), Q-100 (https://www.facebook.com/Q100Rocks/), WLDR (https://www.facebook.com/1019WLDR/) or McLaren Northern Michigan (https://www.facebook.com/northernhealthsystem/) Facebook page and be registered to win weekly prizes. The deadline to enter is 3/1/19. Entries submitted will not be acknowledged or returned. Use of any device to automate entry is prohibited. Proof of submission of an entry shall not be deemed proof of receipt by Stations. The Stations or Sponsor are not responsible for entries not received due to difficulty accessing the internet, service outage or delays, computer difficulties and other technological problems. c. Individuals may enter once during Entry Period. All entries must be received by 12 Midnight on 3/1/19. a. The Promotion is open to all persons who are 18 years of age or older and who are legal US residents who reside in the United States. Employees of the Stations, its licensee, and each of their respective parent, subsidiary and affiliated entities, Station’s advertising and promotional agencies, other radio stations in the Northern Michigan area, the members of their immediate families (spouse, parent, sibling or child) and those living in the same household of each (whether related or not), are ineligible to enter or win. Employees of Sponsor are eligible to enter and to win in this Promotion. This Promotion is subject to all applicable federal, state and local laws and regulations and is void where prohibited. b. Only one (1) winner per household is permitted in any Station-conducted promotion. Listeners are eligible to win a prize valued at $600 or more in a Station-conducted promotion only once every six (6) months. c. The winner may be required to present valid government-issued photo identification and sign and return any required Affidavit of Eligibility and/or Liability/Publicity Release in order to accept the prize. d. Entrants are required to provide truthful information and the Stations will reject and delete any entry that it discovers to be false or fraudulent. The Stations will disqualify any entry from individuals who do not meet the eligibility requirements. The Stations will also delete any entry knowingly received from persons under the age of 13 in compliance with the Children’s Online Privacy Protection Act. Jay's Sporting Goods gift certificate good for Gaylord and Clare locations. Approximate. Retail Value: $250. b. All Prize winners will be solely responsible for all insurance requirements, title, taxes and all other fees and expenses not specified herein associated with the receipt and use of the Prize. The prize shall be awarded “as is” with no warranties, representations, or guarantees, express or implied, with the exception of any standard manufacturer’s warranty that may apply to the Prize. c. All prize certificates must be picked up at the office of the Stations at Blarney Stone Broadcasting, 6514 Old Lake Road, Grayling, MI 49738. The winners will forfeit any prize or prize certificate not claimed within 30 days, or earlier for time sensitive prizes. In the event that a prize or prize certificate is mailed to the winner, it will be with the prior verbal consent of the winner and therefore, winner assumes the risk of its loss. The Stations are not responsible for the safe arrival of a prize or prize certificate. d. There is no substitution, transfer, or cash equivalent for prizes, except that Stations may, at its sole discretion, substitute prizes of comparable value or cash. The prizes are expressly limited to the item(s) listed above and do not include taxes, gratuities or any other expenses. Other restrictions may apply. a. Decisions of Stations management with respect to the Promotion are final. * One (1) winner on February 15, 2019 from all entries only from 12A-MID on 2/14/19. c. Winners will be contacted within 24 hours by phone, Facebook and/or email. d. Odds of winning depend on the number of entries received at time of giveaway. e. Weekly winners must sign any required Affidavit of Eligibility/Release of Liability Prize Acceptance Form at the time of delivery or prize will be forfeited and, if time permits, an alternate winner may be selected in a random drawing of all remaining qualifiers. a. Payments of all federal, state and local taxes are solely the responsibility of the winners. Winners will be required to complete and submit an IRS Form W-9 with full Social Security Number or the equivalent for receipt of any prize valued at $600 or more or for any prizes awarded by the Stations. Failure to submit a complete W-9 or equivalent will result in forfeiture of the prize. b. By participating in the Promotion, each winner agrees to have their name, voice, or likeness used in any advertising or broadcasting material relating to this Promotion without additional financial or other compensation, and, where legal, to sign a publicity release confirming such consent prior to such acceptance of the prize. c. Prior to being allowed to accept any prize or prize certificate, the Stations in its sole discretion may require the submitter of a winning entry to sign a liability release, agreeing to hold the Stations, its corporate licensee, its parent, subsidiary and affiliated corporations, and the officers, shareholders, directors, employees, agents and representatives of each of them harmless against any and all claims or liability arising directly or indirectly from the prize or participation in the Promotion. d. If for any reason this Promotion cannot be executed as planned, including, but not limited to, as a result of infection by computer virus, tampering, unauthorized intervention, fraud, technical failures, or any other causes beyond the control of the Stations that corrupt or affect the security, administration, fairness, integrity or proper conduct of the Promotion, or if the Promotion is compromised or becomes technically corrupted in any way, electronically or otherwise, the Stations reserve the right to cancel, terminate, suspend, or modify the Promotion. If the Promotion is terminated before the original end date, the Stations reserve the right to select the winner by random drawing from among all eligible non-suspect entries received as of the termination time/date or otherwise modify the procedure for selecting winners. e. The Stations, in its sole discretion, reserves the right to disqualify any person tampering with the entry process or the operation of the Station’s website. Failure to comply with the rules of the Promotion may result in a contestant’s disqualification and/or forfeiture of any prize or prizes. If the Stations make a good faith determination that an entrant has cheated or committed fraudulent activity in connection with a Promotion, the Stations reserves the right to disqualify that entrant from entering and/or winning future Promotions and to prosecute and seek damages to the fullest extent permitted by law. f. The Stations reserves the right to make changes in the rules of the Promotion, including, without limitation, the substitution of a prize of equivalent value, which will become effective upon announcement. If due to circumstances beyond the control of the Stations, any competition or prize-related event or travel is delayed, rescheduled, postponed or cancelled, the Stations reserve the right, but not the obligation, to cancel, terminate, suspend, or modify the Promotion and shall not be required to award a substitute prize. g. The Stations are not responsible for typographical or other errors in the printing, the offering or the administration of the Promotion or in the announcement of a prize. h. For a copy of these Official Rules, send a self-addressed stamped envelope for receipt by March 1, 2019 to “McLaren Northern Michigan Get Up & Go Contest – Official Rules,” Attn: Promotions, Blarney Stone Broadcasting, 6514 Old Lake Road, Grayling, MI 49738. For the names of the prize winners send a self-addressed stamped envelope for receipt by June 1, 2019 to the above address marked “McLaren Northern Michigan Contest – Winner List”. 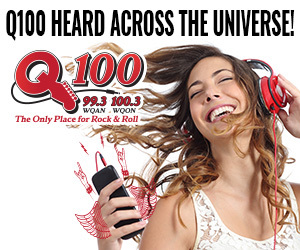 The Official Rules and the Winner List (when completed) shall also be available during regular business hours at the main offices of the Stations and may be posted online at https://www.q100-fm.com and www.1019wldr.com.